No need for any t-shirts in your bag, you can pick plenty of those puppies up at vendor booths at the conference, but my favorite conference swag is books, the rest of that stuff is probably not necessary. I intend to leave room in my suitcase for books and that’s it. Come a day before conference starts. It’s easy to check in and get out the day before conference starts. Checking in the day of will mean lines, long lines! Coming the day before also allows you to take time to get the lay of the land. Also check into public transit. C’mon people, don’t take a cab everywhere! Wear comfortable shoes. Nothing says newbie like stylish uncomfortable shoes. Don’t be foolish. We all know we are doing a lot of walking so don’t think twice about pairing some comfy tennis shoes with your trendy office attire. And really, dress how you feel comfortable. There is no dress code and you’ll see everything from professional dress to jeans and t-shirts. Take a water bottle with you. There was several water stations set up through the conference location, but small cups. It wouldn’t hurt to take a bottle with you (or buy one in the SHRM store) so you can easily tote water around with you. Bring your charger to the conference. There will be charging stations. Get your Twitter thumbs ready! 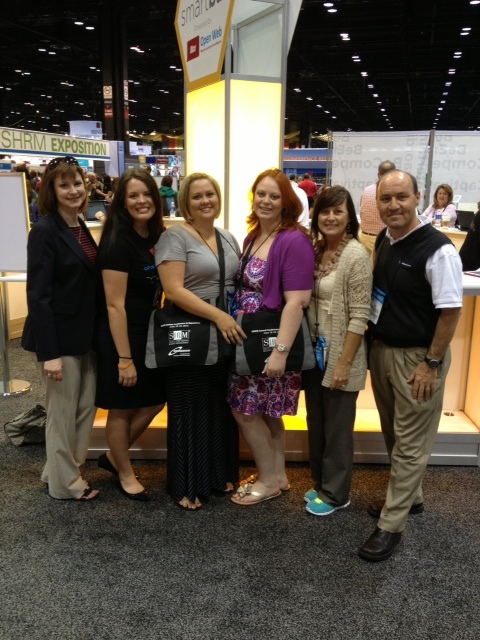 #SHRM13 made it to a trending topic on Twitter this year so we hope to do it again in 2014! *If you do not have a Twitter I highly recommend setting it up before the conference. Twitter is a good tool for your note taking and a great way to follow the Speakers at the conference and the other HR pros you meet there. Review the sessions ahead of time. If you’re going with people you know talk to them about splitting up and sharing notes from different sessions. This will help you make the most of the sessions and force you to network with new people. Each of you may want to choose up to 3 topics for one session in case you need to make changes for logistics or overflow reasons. So much to hear, so little time. Take a hard copy of your session calendar with you in case of spotty Wi-Fi. Be realistic. You probably will not be able to last all day every single day. I recommend deciding if you want to go early or stay late. If you go to a 7am session don’t overdo it and stay through a 4pm session too. Because of this, get plenty of rest leading up to conference time! Bobbi explained it like this, “the flow of the conference is more like a sprint than a marathon, prepare accordingly”. Furthermore, pencil in down time on your schedule. This will allow you to stay fresh! You will also learn from talking with your fellow conference goers so realize the value in connecting with your fellow HR pros! Meet with some vendors. Not just enter to win. I recommend really looking at the vendor list before you get there and deciding who you may utilize (whether it be for now or in the future) at your organization and make the most of your time at the conference. You never know what you may learn from a vendor or what idea it can spark. And after all, without vendors we really wouldn’t have as great of a conference. So pick 2 or 3 that you like and start from there. Take notes. Really take notes that you can take back to your organization and present. Make this conference a resource for your organization, not just for yourself. Last, but certainly not least, if you sign up now for #SHRM14 in Orlando you can save yourself (or your company) some dollars! Pop on over to the shrm.org website and check it out! Some of my super cool HR buddies! Check out Angela’s comfy shoes! Do you have any “prepping for annual conference” tips? Leave them in the comments! New and Improved...and still got nothing. A southern girl married to a cowboy!